PSL NarissaraSP Italic PSL Series 3, Version 1.5, release November 2002. PSL NarissaraSP Italic PSL Series 3, Version 1.0, release November 2000. PSL NarissaraSP Bold Italic PSL Series 3, Version 1.0, release November 2000. PSL NarissaraSP Regular PSL Series 3, Version 1.5, release November 2002. PSL NarissaraSP Bold PSL Series 3, Version 1.0, release November 2000. PSL NarissaraSP Regular PSL Series 3, Version 1.0, release November 2000. 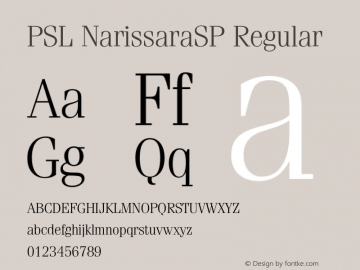 PSL NarissaraSP font family series mainly provide Bold,Bold Italic,Italic,Regular and other font styles.